Located in the heart of Headingley, Cafe Lento surpasses any prior expectations one may have of a student orientated coffee shop. The poster-laiden brick walls and unfeasibly friendly staff make you feel welcomed and at home the second you walk through the door. Decorated with a catalogue of quirky 80's CD's and obscure children's fiction, the passion and story behind Cafe Lento is absolutely apparent - injecting character and flair into a place where an original voice is anything but the norm. The menu is caring and all-encompassing, even cutely declaring that, "If you don't see anything you like on the menu, just ask and we'll see what we can do". Vegans and celiacs are catered for extensively, with a vast array of sandwiches, cakes and smoothies made to order. For food so appetising and quantities so generous, the prices are surprisingly reasonable - especially when considering all the food is free ranged and locally sourced. This liberal and loyal attitude is extended to their quirky Friday nights, where Cafe Lento holds an intimate jazz night, celebrating local musicians and graduates from Leeds College of Music. 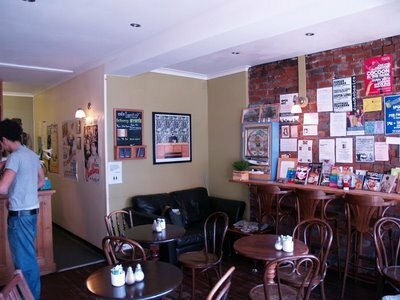 Without a flicker of doubt, Cafe Lento is easily the only place in Headingley which can boast true originality and community spirit. The passionate and charming owner goes above and beyond to make your visit not only a pleasure but a true experience. Cafe Lento allows its visitors, both students and locals alike, to feel wholly welcomed and valued in a hub of character and comfort.